Wagging Dog Rescue has embarked upon a new endeavor – CATS! 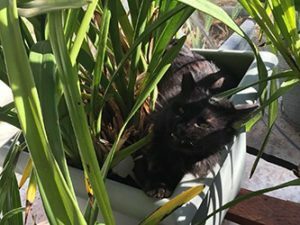 Feral and semi-feral felines are euthanized daily at municipal (open admission) shelters, so we’re solving two problems with one animal – CATS! By rescuing these animals to place in approved barn homes, we reduce the number of ferals killed in our local shelters while also helping our community members to manage unwanted guests in an eco-friendly way! Got rodents? When people use poison, they not only kill rodents but also other animals including family pets, the good garden snakes and opossums, and birds of prey who are doing their own work patrolling for critters. Giving a home to a rescued barn cat (or several) is a great way to keep critter populations managed with natural methods. Plus it’s a win win – by adopting, you save the lives of feral/semi-feral felines who would otherwise not survive an animal shelter. You give them a second chance, the best chance they’ve probably ever been gifted. Available cats for barn home placement varies daily in local shelters. We do not accept privately owned felines into our program. We do not charge a fee for the adoption of our feral cats but do ask adopters to consider a donation to our rescue. Please remember that our entire team is all volunteer and we rescue around our family and work schedules. We’re grateful for your understanding and patience and hope you’ll appreciate our thoroughness with the care and placement of our rescued felines. All barn cats are spayed/neutered, current on vaccinations, dewormed, microchipped, and ear tipped. Adoption Checklist - I'm ready to adopt my barn cats! I’ve read the FAQs and have all of these items ready for each cat. My barn cats can move in any time! Do I need a barn? Cat enclosure in progress. In order to save their lives, the cats moved in before it was ready. No. 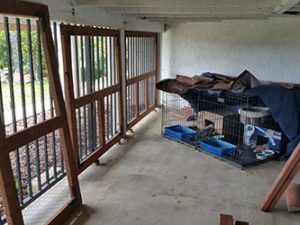 A barn or stand alone structure is not required to adopt working felines. All homes and properties are unique, and each has unique options to offer a safe place for feral felines. We’re happy to discuss your particular space and what options you might have available. The Rescue Lady’s barn cats live under a deck of the house, in an area that is accessible to them and safe from predators. (She and her husband built a secured enclosure that can be used as needed, with insulated cat condos that no one appreciates.) Other people have used chicken coops, sheds, tack rooms, garages … there can be many options for a safe location for the cats! How long does it take a barn cat to acclimate to his/her new environment? When your new barn cats arrive at their new home, we’ll ask you to securely confine them for 4-6 weeks so they can acclimate to their new environment and caregivers. This confinement period will help them to decompress after their stressful shelter experience. It will also allow them time to get used to the new humans in their lives, people they can learn to trust. The confinement period establishes a reliable daily routine of feeding and care and creates an association that the ‘barn’ is a place of safety, food and shelter. Once the cats are released after an appropriate confinement period, they will be much more likely to remain on your property and continue with the regular routine. How do I confine my barn cats for their acclimation period? Crate setup with hiding box, litter pan, bowls and a bed. If you have a secure space around your home or other structure, awesome! There should be no gaps greater than 1 1/2″. Yes, you read that right – 1.5 inches. Cats can squeeze through some ridiculous spaces, and most feral cats are not huge like the average indoor house pet. (We probably won’t be able to find you a 15 or 20 lb. feral.) Cats have flat skulls and can squish through any opening that their head can fit through. You can modify openings with chicken wire if needed to eliminate any exit points. We’re happy to discuss your options if minor modifications (or building a cat enclosure!) is of interest to you. Alternatively, a 42″ wire or plastic crate will suffice to safely confine your cats during their acclimation. One 42″ crate per feline, each with its own set of interior decor (litter pan, food/water bowls, cardboard box for hiding, towel or similar for bedding). 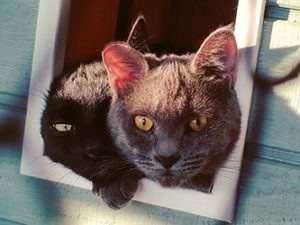 Will my cats remain after their acclimation period? Vader left a few days after release. She didn’t like the other barn cat from the get go. He’s still in his barn home, with a new BFF. We sure hope so but it’s impossible to know until they’re released. Occasionally adopters will put a lot of effort into their preparations and care, only to have a feral cat leave shortly after release. (It happened to the Rescue Lady.) It can be a bit of a stab in the heart lol, but all animals are individuals – especially cats. Because the cats in our Barn Cat Program come from shelters where they were not able to be handled by staff, there is no way to know how they will do with another cat(s). Like dogs, some cats like some cats and do not like others. Some may just wanna see what’s on the other side of the fence, always. Barn cat rescue and adoption is unique in that there are more unknowns when working with animals who are wild or can’t be handled. We do our best when helping you to select your working felines but can only make educated decisions about these living creatures. If, upon release, one of your barn cats doesn’t stick around, we will place another feral/semi-feral shelter cat with you and try for success the next time. Do I have to feed my barn cats? Yes. These are working animals. Just because you feed them doesn’t mean they won’t hunt. Feeding your barn cats a healthy, nutritious diet twice a day not only keeps them in tip top working shape but also reaffirms the bond each day between the cat and his/her territory. You also don’t want your hunters consuming their catches – you know, in case one of your neighbors uses rat poison etc. Healthy hunters are the best hunters. And when it’s dinner time, they’ll come running from anywhere on your property. It’s kinda cute! Should I feed canned food? It’s up to you but we suggest yes. Cats in general do not consume enough water, and private vets anywhere will tell you as much. Most of their feline patients are dehydrated. Canned cat food has a high water content (and feel free to add more when you prepare it). It’s also like the junk food of the cat world. During the initial confinement period, we suggest feeding canned food for one or both meals each day. You want your new cat to think living with you is wonderful and magical, so they’ll be more likely to stick around once they’re released. The Rescue Lady feeds her feral felines (post release) kibble for breakfast and canned food (pate style) for dinner (with a little added water). Will I be able to pet my barn cats? 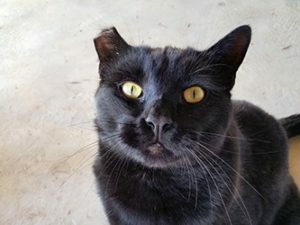 If petting your barn cats is important to you, please be sure to let us know so we can look for semi-feral felines vs cats that are believed feral. 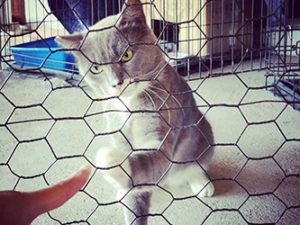 Cats end up in shelters for any number of reasons, and sadly they don’t get as many behavior breaks as dogs do – probably because: claws! When animals find themselves in a shelter situation, their stress levels skyrocket and stay there until long after they physically leave that setting. Many dogs tend to adapt more readily to this sudden change than do cats. If a cat can’t be handled at a shelter, he/she will not be made available for adoption. Sometimes, however, a feline just needs time to decompress outside of a shelter setting and show us that they’re really not feral after all. They might be semi-feral (maybe they had a home once upon a time) or even an unfortunate house cat (like our boy Tux!). Many rescued barn cats can be ‘tamed’ (of sorts) during their confinement period. An owner can often teach the cats that petting and scratches are quite enjoyable. Sometimes the ‘feral’ cats even become touch junkies! So sweet when you think that they may never have felt a kind touch in their lives. Some surgeons take off more ear than others. An ‘ear tip’ signifies that a cat has been fixed. During spay/neuter surgery, the tip of one ear will be cropped. This procedure is not done for most indoor/tame cats. If someone sees a feral cat in their neighborhood with a tipped ear, or animal control spots a wandering feline with that bit of identifying info, they’ll know that the animal has already been TNR’d – trapped, neutered (or spayed), and released back to their neighborhood. You might also see the acronym TNVR – trap, neuter, vaccinate, release. Community TNR/TNVR programs help to reduce the number of unwanted cats/kittens as well as the number of lives being killed in our shelters due to overpopulation. Euthanasia is not a form of population control. Should my barn cats wear collars? Should I trim my barn cat's nails? No. Claws are a major part of an outdoor cat’s defense system. 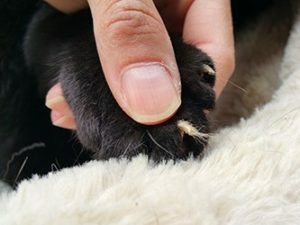 Trimming their nails (or far worse and inhumane, declawing) can be a death sentence for a working cat, akin to sending a soldier to war without a weapon. Nails and claws need to remain as nature intended. Appropriate scratching areas should be provided for any feline (indoor or outdoor). You can speak with your veterinarian about getting a prescription for Comfortis or similar edible feline monthly flea preventative. It’s not likely that you’ll be able to apply a topical product to your barn cats each month. Flea collars are an absolute no. The Rescue Lady fasts her felines for breakfast on the day of application and only feeds dinner; crushes the flea tablet and mixes with a small amount of wet food for each cat; and hopes they’ll consume enough medication to protect them. After all, cats will be cats. Why must I adopt 2 or more barn cats? Coyote fur. Someone was lucky and hopefully learned some valuable life skills. Living in a semi-rural area, the Rescue Lady hears this question/concern often. Her take on it is this: All of the cats in WDR’s Barn Cat Program come exclusively from municipal (open intake) shelters where they’ve run out of time. They will be euthanized by the shelter if not rescued, sometimes in as little as 24 hours. 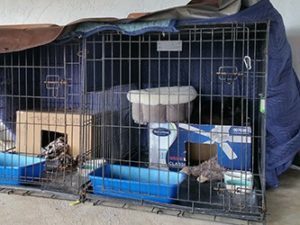 Shelters can only care for feral felines for so long, and if they can not (or will not) TNR (release the cat back to its neighborhood), they euthanize instead. By rescuing these unfortunate animals and placing them into barn homes, we’re giving them the best possible chance for an acceptable quality of life as anyone possibly can. With human caregivers to watch out for them should they one day become sick or need a vet, who ensure that they have reliable meals every day, a space to sleep and stay safe from the elements and more – we feel that this is a positive outcome for these cats and also the humans who adopt them. (We’ve already had 2 ‘feral’ felines become cherished indoor house pets, and we’re working on increasing that number!) You can also google ‘coyote proof cat shelter’ for all kinds of ideas for bolt boxes that you can place on your property. You’ll find everything from fancy handcrafted insulated wood shelters to equally serviceable (and still insulated) shelters made from plastic storage bins! Escape routes, access points and bolt boxes will help your working cats to remain safe on the job. These are some of the beautiful feral felines that WDR has rescued at the eleventh hour and placed in Southern California barn homes. Take the next step and fill out an application!